Recently, our remaining bachelor son arrived for a welcomed visit (with two bags of his laundry in tow). It didn’t take long for him to camp out in his old room, now a guest room. And, just as quickly found his mother’s left overs in the refrigerator. The microwave soon emitted a terrible crunch. A jadeite dinner plate he was using to warm up his lunch cracked in half. Our vintage Fire King jadeite plate, a favorite dish in all Arts & Crafts era Craftsman bungalows was literally history. It now has a repurpose as a garden edge, see image below. Facing up to his mother, he mumbled that he read on the bottom of the plate that it was oven proof. Sadly, our $5 plate purchased a few years ago, is now fetching $40 on e-bay. All was forgiven, however when our Millennial spent an hour sprucing up his boomer parents’ computers. 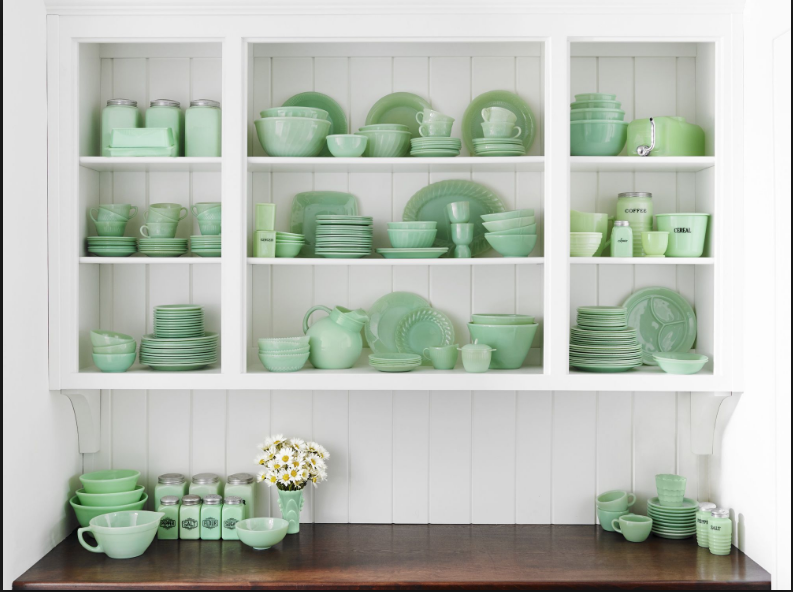 Here’s what Glass Encyclopedia has to say about the Fire King Company’s green jadeite dishware: Anchor Hocking Glass Corporation (makers of jadeite Fire King dinnerware) was created in 1937 from the merger of Hocking Glass with the Anchor Cap and Closure Corporation. The Hocking Glass Company was founded in 1905 by Isaac Jacob (Ike) Collins in Lancaster, Ohio, and named after the Hocking River. A few years later, in 1942, they introduced their hugely popular “Fire King glassware, which continued into production until the late 1970s. Even as late as 1992 Anchor Hocking made some Fire King items to celebrate the 50th anniversary of the lines introduction. Fire-King was pressed glass dinnerware and kitchenware made from oven-proof glass, usually opaque apart from a few items like the clear "crystal" line in ovenware which was included as Fire-King. Two special colors in Fire-King have become very popular and easily recognized - the pale green "Jade-ite" and the iridized peach color with a mirror finish called "Peach Lustre" which is illustrated on the left. All kinds of dinnerware patterns were produced in Fire-King, in plain colors or with transfer printed floral or natural or geometric designs. The shapes were very practical and there was a huge range of items to choose from. Fire-King even carried a two year guarantee on the label. Most Fire-King glass is marked but there are several different identifications. The most common Anchor Hocking trademark is an anchor with an H straddling the stem. The mug above on the left says on the bottom: Anchor Hocking Fire-King OVEN PROOF Made in the USA, and there is also an anchor supporting an H and the number 33. There was a thicker version of Fire-King glassware produced for the restaurant industry, and this was probably the most popular of all. In the first six years they sold 25 million pieces! Again, a reminder to Jadeite owners: After all these years, some pieces of Fire-King are not as oven-proof as their makers claimed. Be cautious about using your precious collection in the microwave. The history of Anchor Hocking is a story of a company that started small, but grew through initiative and desire on the part of its founders and employees. Isaac J. Collins founded the Hocking Glass Company in 1905 in Lancaster, Ohio. The Hocking Glass Company got its start with $25,000 that was raised by founder Isaac J. Collins. In 1905, the company started small with just 50 employees housed in an old carbon plant, called the “Black Cat”, so named because its walls were blackened with carbon dust. The first year, $20,000 worth of glassware was sold. Fire destroyed the “Black Cat” in March of 1924, throwing some 650 employees out of work. The employees, townspeople, fireman all worked together to battle the fire, but by morning all that remained were five acres of ashes and rumble. The dusty old carbon plant was destroyed, but not the spirit of Hocking Glass, by the end of the following day, the Company had set up temporary offices in a vacant grocery store. Hocking Glass purchased controlling interest in the Lancaster Glass Company in April 1924 and used its facilities to meet shipping requirements. At the time of its purchase by Hocking, Lancaster Glass had one continuous tank and one day-tank. While Plant 1 was being rebuilt over the ashes of the “Black Cat”, Hocking was producing and shipping from Lancaster Glass. This purchase later became known as Plant 2. Plant 1 was in production by October, 1924, just six months after the fire. This time the plant was more conducive to glass manufacturing. Today, in the year, 2012 the Anchor Hocking Company stands in the original sight. The company became the Anchor Hocking Corporation on December 21, 1937, with the merger of the Hocking Glass Company and subsidiaries and Anchor Cap Corporation and its subsidiaries. The “Anchor” came from the phrase that caps “were anchored for safety. The depression Era saw another revolution in machine-made glassware. The Company knew that it had to produce tumblers as cheaply and quickly as possible if they wanted to sell in volume. Wilbur Secoy and William Fisher, both company employees designed and built a rotary 15-mold machine that could make 90 pieces of blown glassware a minute. With that machine (called the FS for Fisher and Secoy) the Company could sell tumblers “two-for-a –nickel,” which was less than half of what it formerly cost. During the next 50 years The Anchor Hocking Corporation grew through acquisitions and mergers to become a diversified manufacturer making consumer and industrial products sold around the world. Fire destroyed the manufacturing facility in March of 1924, throwing some 650 employees out of work. The employees, townspeople, fireman all worked together to battle the fire, but by morning all that remained were five acres of ashes and rumble. Hocking Glass purchased controlling interest in the Lancaster Glass Company in April 1924 and used its facilities to meet shipping requirements. At the time of its purchase by Hocking, Lancaster Glass had one continuous tank and one day-tank. The company became the Anchor Hocking Corporation on December 21, 1937, with the merger of the Hocking Glass Company and subsidiaries and Anchor Cap Corporation and its subsidiaries. The “Anchor” came from the phrase that caps “we're anchored for safety". On July 1, 1987, Anchor Hocking became a member of the Newell Group. Since then the manufacturing operations of the consumer glass division have been consolidated into this facility and a second manufacturing plant in Monaca, Pennsylvania. The primary focus tableware, ovenware and various other household glass products for the high volume retail, specialty and foodservice businesses. Newell Rubbermaid sold Anchor Hocking to Cerberus Investment Group; Global Home Products is formed comprising Anchor Hocking, WearEver Cookware and Burns of Boston Picture Frames. April, 2007 Monomoy Capital Partners, LLC purchases Anchor Hocking. November 19, 2008 Monomoy Capital Partners acquired Indiana Glass Company and E.O. Brody Company from Lancaster Colony Corporation. March 2008 E.O. Brody sold to Syndicate Sales. Sapulpa, OK plant closed. Processes moved to Lancaster, Ohio. November 1, 2011 Monomoy Capital Partners acquired Oneida ltd.
April 2012 –EveryWare, Inc. becomes the corporate parent of the newly-merged Anchor Hocking and Oneida Companies. May 2013-EveryWare Global, Inc. goes public. EveryWare Global filed for bankruptcy in 2015. EveryWare Global was renamed The Oneida Group in 2017.